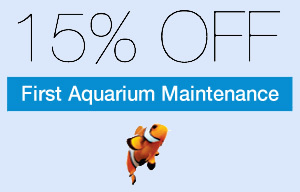 Saint Louis Area Aquarium Maintenance Services and Aquarium Keeping Information and Products. It doesn't matter if you're just starting your first aquarium or if you're a seasoned expert with a lifetime of saltwater and freshwater aquarium keeping experience; Saint Louis Absolute Aquariums has something for you. Saint Louis Absolute Aquariums has a database of resources and articles including invaluable information, a regular aquarium blog, lots of new and used unique items and livestock for sale at wholesale prices, local Saint Louis aquarium maintenance and installation services, and much more. Installing and Maintaining An Aquarium In Your Home or Business Can Be A Huge Task Requiring A Vast Amount of Time, Energy, and Knowledge. Let Saint Louis Absolute Aquariums Take On This Task For You!! Regularly Updated Video and Photo Blog Covering The Ongoings Of Saint Louis Absolute Aquariums Own 90 Gallon Saltwater Mixed Reef Aquarium.